On Friday, Dayton, Power & Light workers continued their efforts to fix the downed poles in the county from last weekend’s snow and ice storm. Many trucks and crews helped with a power line that stretched across State Route 41 near the U.S. 35 bypass that continued to keep the road closed for the last week. 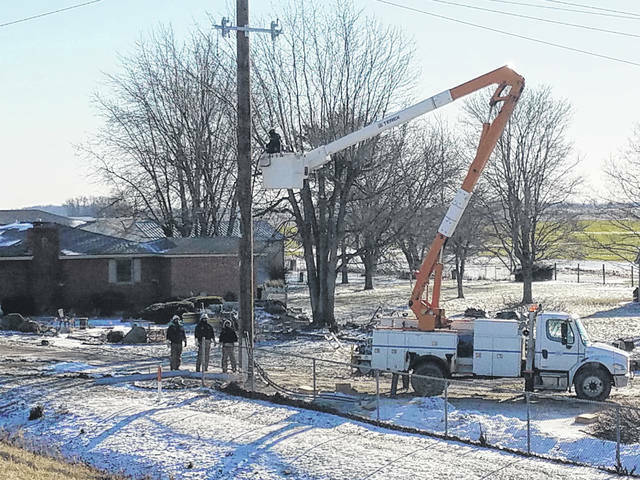 https://www.recordherald.com/wp-content/uploads/sites/27/2019/01/web1_20190125_153813.jpgOn Friday, Dayton, Power & Light workers continued their efforts to fix the downed poles in the county from last weekend’s snow and ice storm. Many trucks and crews helped with a power line that stretched across State Route 41 near the U.S. 35 bypass that continued to keep the road closed for the last week.